At a time where so much emphasis is being put on safety in sport it seems fitting that such a unique product has been developed to counteract the worries some might have. The Fitguard Mouthpiece was demoed at CES this week and it captured a lot of attention and rightly so. The Fitguard has been designed to detect concussions and other potential brain injuries, which have and can be hard to spot in sport. Ok getting technical now, how does it work? 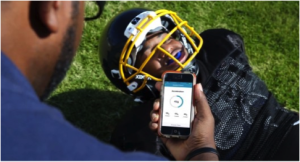 The mouth guard has a built in accelerometer and gyroscope that monitors linear and angular acceleration to detect potential concussion-class impact. If you’re involved with a heavy impact the Fitguard will light up red and notify surrounding players or coaches that potential medical precautions may need to be addressed. In case you’re unable to see the player who’s down – for example it could be during play – a Bluetooth notification is sent to the coach or person on the touchline you’ve paired the mouth guard to. This is an ideal piece of equipment for sports such as rugby, boxing and American football where wearing a mouth guard is generally used or mandatory. Not to mention these are some of the sports where heavy impacts and concussions most commonly occur. The product is currently still in a Kickstarter mode, however you can expect to see this hit the shelves in late September/October of this year, retailing at an estimated $130.